Hello Friends, Happy weekend! 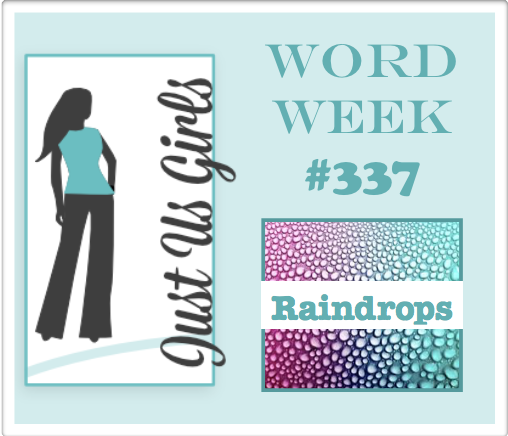 Today over at Just Us Girls it’s word week and Lisa has selected the word Raindrops for us! I had such a great time fussy cutting my umbrellas for this card. However, the overall design and layout came from this card I came across over on Pinterest…it’s by Amy Kolling. I am not sure my background is all that great, but I still had my watercolor brush out and thought …why not! The clouds are from Lawn Fawn and the umbrellas are paper pieced from a stamp I picked up who knows where. The sentiment is from Verve! Categories: Cards | Tags: Card making, Cards, rubber stamps, stamping | Permalink. Adorable card. 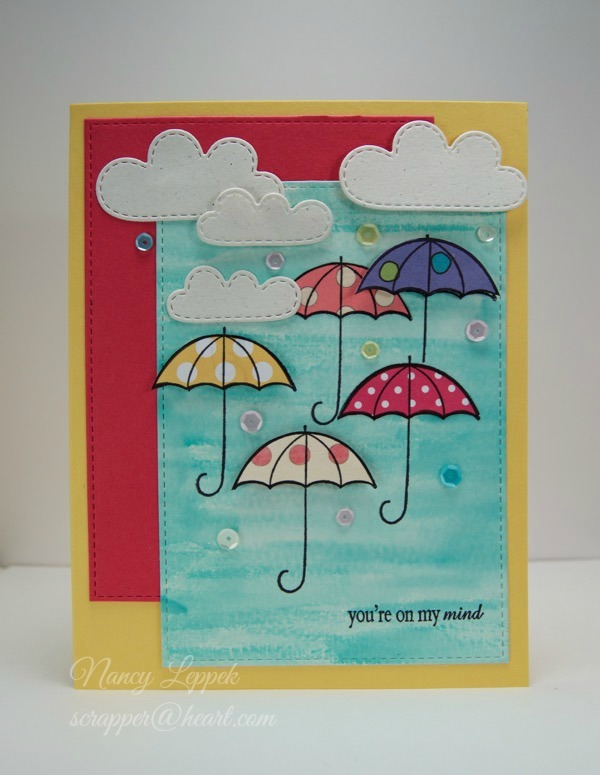 Love all the colorful umbrellas and the design of your card. Oh, I just love this!!! Fussy cutting the umbrellas with all those different patterned papers is genius! Really sweet card!!! I am loving those beautiful polka dotted umbrellas! Beautifully done! Super colourful card. Love those umbrellas and your paper piecing. Great background. I think your background turned out awesome! Love the little umbrellas and sequin raindrops. So much for April showers, we are under a winter storm warning! This is certainly a cheery card! Love those umbrellas and clouds! This is wonderful! Love all those cool “stitched” type dies and those umbrellas are awesome! Great job.